ADI believes that newly released government figures on the number of animals used in experiments are just the ‘tip of the iceberg.’ 792,168 animals were subjected to procedures in the US in 2017, a decrease of 28,644 on the previous year. However, the annual figures from the USDA fail to include mice, rats, and birds, species that, shockingly, are not covered under the Animal Welfare Act. 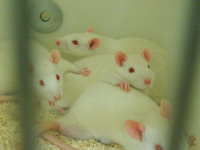 The National Association for Biomedical Research estimates that 95% of animals used in US experiments are mice and rats, which puts conservative totals for their use into the tens of millions. ADI urges the USDA to acknowledge the forgotten millions, and to reveal the full extent of animal use in US laboratories. In another study, researchers at Baylor College of Medicine in Texas conducted experiments on macaque monkeys to investigate brain cells’ response to gravity. Researchers attached permanent implants to the monkeys’ skulls (for immobilization), inserted electrodes into their brains (to make recordings), and attached coils to their eyes (to measure movements). The monkeys were restrained in chairs inside a motorized enclosed simulator, and researchers rotated the animals in different directions 24 times to create “sensory conflict.” These monkeys not only suffered from the implants in their heads and eyes, but also from the stress of being restrained in the chair, placed in the simulator, and spun around. These painful, invasive experiments were also unjustified because the processing of gravity direction in the human brain has already been studied extensively in brain-damaged patients. Studies on brain areas associated with the perception of gravity are also carried out with human volunteers, using non-invasive methods such as fMRI scanning. ADI recently provided evidence to the US Food and Drug Administration to support the adoption of human-relevant non-animal methods as part of the FDA’s roadmap and recommendations for safety testing of particular products, such as e-cigarettes. Safety (toxicology) testing often involves animals being force fed substances and drugs or having them applied to their skin. Such research has been shown to be unreliable in predicting how safe they are in humans. Last month, California passed the Cruelty-Free Cosmetics Act (SB 1249), which outlaws the import and sale of cosmetics and cosmetic ingredients tested on animals from January 1, 2020. ADI supports this and similar national legislation, the Humane Cosmetics Act (HR 2790), which seeks to phase out animal testing for cosmetics within three years. If you live in the US, please contact your Representative and urge them to support the Humane Cosmetics Act (HR 2790) and other measures supporting the adoption of advanced scientific methods.